I mentioned this passage from The Pickwick Papers not long ago in a post on The Far Corner as an example of the comedy that can arise when sports and language interact. It’s about cricket, it was written in the mid-1830s, and it’s completely fictional, but I still think this account of the match between Dingley Dell and All-Muggleton is one of the best commentaries on the human tendency to read meaning back into athletic competition. It’s also one of the funniest passages about sports that you’ll ever come across. By the end of post-match banquet, the names of the athletes (Dumkins, Luffey, Podder, and Struggles) have gotten so mixed up, and so overstuffed with ideas, that they become a kind of inspired nonsense poetry. But it’s also a really warm passage; Dickens makes the good cheer among the increasingly tipsy gentlemen as touching as it is ridiculous. 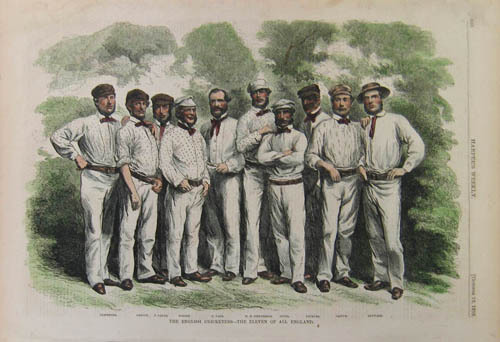 All-Muggleton had the first innings; and the interest became intense when Mr. Dumkins and Mr. Podder, two of the most renowned members of that most distinguished club, walked, bat in hand, to their respective wickets. 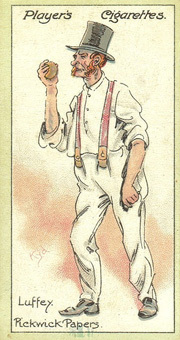 Mr. Luffey, the highest ornament of Dingley Dell, was pitched to bowl against the redoubtable Dumkins, and Mr. Struggles was selected to do the same kind office for the hitherto unconquered Podder. Several players were stationed, to “look out,” in different parts of the field, and each fixed himself into the proper attitude by placing one hand on each knee, and stooping very much as if he were “making a back” for some beginner at leap-frog. All the regular players do this sort of thing;—indeed it is generally supposed that it is quite impossible to look out properly in any other position. The umpires were stationed behind the wickets; the scorers were prepared to notch the runs; a breathless silence ensued. Mr. Luffey retired a few paces behind the wicket of the passive Podder, and applied the ball to his right eye for several seconds. Dumkins confidently awaited its coming with his eyes fixed on the motions of Luffey. “Play,” suddenly cried the bowler. 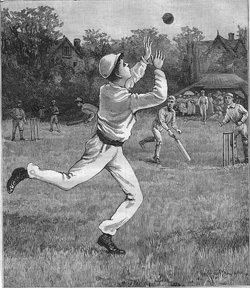 The ball flew from his hand straight and swift towards the centre stump of the wicket. The wary Dumkins was on the alert: it fell upon the tip of the bat, and bounded far away over the heads of the scouts, who had just stooped low enough to let it fly over them. “Run—run–another.—Now, then throw her up—up with her—stop there—another—no—yes—no—throw her up, throw her up!”—Such were the shouts which followed the stroke; and at the conclusion of which All-Muggleton had scored two. Nor was Podder behindhand in earning laurels wherewith to garnish himself and Muggleton. He blocked the doubtful balls, missed the bad ones, took the good ones, and sent them flying to all parts of the field. The scouts were hot and tired; the bowlers were changed and bowled till their arms ached; but Dumkins and Podder remained unconquered. Did an elderly gentleman essay to stop the progress of the ball, it rolled between his legs or slipped between his fingers. Did a slim gentleman try to catch it, it struck him on the nose, and bounded pleasantly off with redoubled violence, while the slim gentleman’s eyes filled with water, and his form writhed with anguish. Was it thrown straight up to the wicket, Dumkins had reached it before the ball. In short, when Dumkins was caught out, and Podder stumped out, All-Muggleton had notched some fifty-four, while the score of the Dingley Dellers was as blank as their faces. The advantage was too great to be recovered. 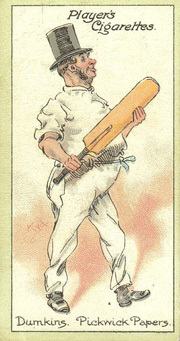 In vain did the eager Luffey, and the enthusiastic Struggles, do all that skill and experience could suggest, to regain the ground Dingley Dell had lost in the contest—it was of no avail; and in an early period of the winning game Dingley Dell gave in, and allowed the superior prowess of All-Muggleton. [T]he company straggled into the town in little knots of twos and threes; and within a quarter of an hour were all seated in the great room of the Blue Lion Inn, Muggleton—Mr. Dumkins acting as chairman, and Mr. Luffey officiating as vice. There was a vast deal of talking and rattling of knives and forks, and plates; a great running about of three ponderous-headed waiters, and a rapid disappearance of the substantial viands on the table; to each and every of which item of confusion, the facetious Mr. Jingle lent the aid of half-a-dozen ordinary men at least. When everybody had eaten as much as possible, the cloth was removed, bottles, glasses, and dessert were placed on the table; and the waiters withdrew to “clear away,” or in other words, to appropriate to their own private use and emolument whatever remnants of the eatables and drinkables they could contrive to lay their hands on. Here the little man ceased, and here the company commenced a raising of voices, and thumping of tables, which lasted with little intermission during the remainder of the evening. Other toasts were drunk. Mr. Luffey and Mr. Struggles, Mr. Pickwick and Mr. Jingle, were, each in his turn, the subject of unqualified eulogium; and each in due course returned thanks for the honour. Enthusiastic as we are in the noble cause to which we have devoted ourselves, we should have felt a sensation of pride which we cannot express, and a consciousness of having done something to merit immortality of which we are now deprived, could we have laid the faintest outline of these addresses before our ardent readers. Mr. Snodgrass, as usual, took a great mass of notes, which would no doubt have afforded most useful and valuable information, had not the burning eloquence of the words or the feverish influence of the wine made that gentleman’s hand so extremely unsteady, as to render his writing nearly unintelligible, and his style wholly so. 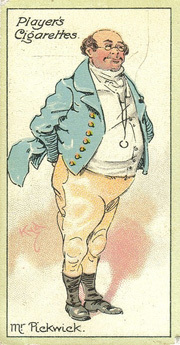 By dint of patient investigation, we have been enabled to trace some characters bearing a faint resemblance to the names of the speakers; and we can only discern an entry of a song (supposed to have been sung by Mr. Jingle), in which the words “bowl” “sparkling” “ruby” “bright” and “wine” are frequently repeated at short intervals. We fancy, too, that we can discern at the very end of the notes, some indistinct reference to “broiled bones”; and then the words “cold” “without” occur: but as any hypothesis we could found upon them must necessarily rest upon mere conjecture, we are not disposed to indulge in any of the speculations to which they may give rise. Dickens’ cruelty is so much fun, and in an odd way so much more real than his great uber-humanist contemporaries [or would James and Eliot expire of genteel horror at being called that?]. This is marvellous, Brian, thanks for posting. James would mark you down for omitting the umlaut. James was a serious hümanist.